The Funky Seventies has captured the atmosphere of the pop - culture of the 70’s in this great slot machine from Net Entertainment. Funky is the right word for it; the music, the colours and the iconic symbols of the 70’s are all in focus here. There is a pumping funk song playing during the main game that takes you back to the roller skater discos. The platform shoes, glittering disco ball and the cassette decks makes you re-live the funkiest decade in the history of man. The Funky Seventies has 5 reels and 40 pay lines! The free spin feature is activated by hitting three or more scatters and all wins pay X2. The Funky Seventies is a very entertaining slot machine and it will give you the chance to win big or perhaps even make you wanna hit the dance floor in your old disco outfit. The Funky Seventies slot machine offers you a great chance to spend some time in past while winning it big! The whole concept of this slot is very complete. The first thing that you will notice is the great music that is pumping in the background while playing this slot machine. The funky tunes resemble some of the greatest funk songs from the 70’s. It really sets a great atmosphere to the game. The graphics is also great. 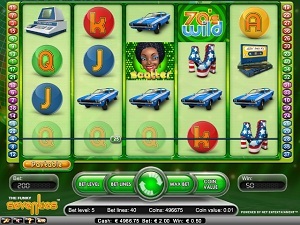 The main colouring of this slot is light green and the colourful symbols create a nice contrast. Net Entertainment use a lot of iconic 70’s objects as symbols in this game. The overall impression really takes you back to the 70’s. As mentioned above, The Funky Seventies has some of the most iconic items from the disco decade. You will see glittering disco balls, sports cars, cassette deck and the platform shoes. The wild is the 70’s Wild logo and it will substitute for all symbols except for the scatter. The scatter symbol is the disco queen symbol. If you hit 3 or more of this one on the reels, you will unlock the free spin feature. The lower paying symbols are the card deck symbols; J, Q, K and A. Once you hit 3 or more scatters you will be awarded with the free spin feature. Each free spin feature has 5 free spins with a win multiplier of X2. You can re-trigger the free spin feature while you are playing it and this will give you an additional 5 free spins added to the feature. The Funky Seventies has 5 reels and 40 paylines. The maximum bet per pay line is 0.50 coins and the minimum is 0.01 coins. There is also an auto play function that is very comfortable to use, especially when you can’t gamble your reel wins. The auto play function is activated by clicking the auto function in the lower left part of the game window.